The Android update world slowed to a crawl this week. But there was plenty of other news to get our attention, with Samsung showing off the Galaxy Note 7 and several new rumors about all the new software tricks in the upcoming Nexus phones. Distribution numbers: Another month also brings the latest distribution numbers for the given versions of Android out there in the wild. Marshmallow is up from 13.3 percent last month to 15.2 percent this month. Hooray? 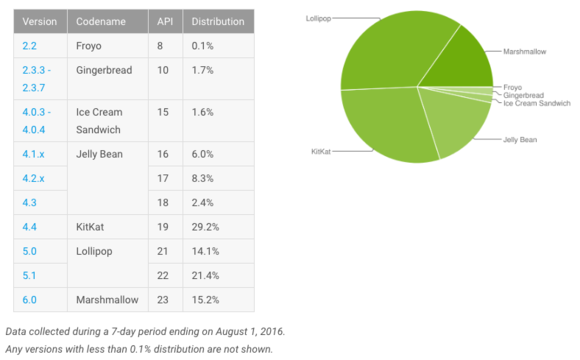 July saw minimal growth for Android Marshmallow. As you can see, however, large swaths of the ecosystem are still stuck on Lollipop, KitKat, and even Jelly Bean. Most of the flagships have made their way to Marshmallow by now, but Android is populated with many low-cost phones in emerging markets that don’t get timely updates. The cycle is going to reset soon with an imminent launch of Nougat, which will probably be at about 15 percent at this time next year.